Make Ice Cream out of Snow! The best part? It's super easy, you can make it in 5 minutes!!!! other options: 1 sliced banana (banana chocolate, YUM!! ), ½ c. berries, scoop of peanut butter. Blend on high for 3 minutes, until the cream thickens. Have the kids fill a large mixing bowl with clean snow. Pour the cream mixture over the snow and fold in crushed cookies, chocolate chips, or whatever toppings you want. Eat it fast, it’s best fresh!! We all know how picky kids can be. They’ll tell you that something is their favorite food one day only to announce the next week that they don’t like it and won’t eat it again. Here are some ways to bring the fun back into mealtime and to help everyone enjoy meals! Also, check out the comments section of my Bloggy Giveaway post for some great ideas from other moms!! 3) Keep introducing new foods even if they don’t eat it the first (or 10th ) time. They’ll get used to having different foods and eventually will try them. Always place at least a bite or two of something new on their plate. 1) Give choices and let them play! You might like it, too! a. sandwich mosaic—spread a piece of bread or tortilla with peanut butter or cream cheese. Have various fruits, cheeses, meats cut into small pieces and let them make a picture on their “canvas” with the food chunks. d. go “fishing” with pretzel sticks, peanut butter, and goldfish crackers. 2) At least once a week, try something new. They’re more adventurous then you think! b. Learn where it comes from & the people who eat it. http://www.peacecorps.gov/kids/like/index_food.html is a great website for this. d. Small amounts of ketchup or other sauces can be put in a baggie, snip the end, and draw on plates or food. 4) Call it another name. a. draw a crown on a napkin and serve “princess soup” or let them wear a crown while eating it. 5) Have regular meal/snack times. It’s hard with a lot of kids but will cut down on your stress. If they don’t want to eat, no worries. Let them know they can eat at the next meal time. We make these often. I saw this picture a long time ago in a magazine. 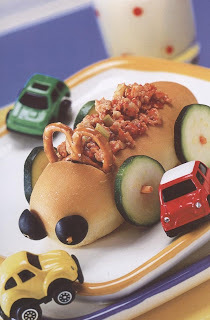 You can tell from the picture that you simply take a hot-dog bun, hollow it out, add some "wheels" with cucumbers and carrot spokes, olive headlights, and a pretzel steering wheel. You can get creative and use whatever you have around to make the "car". Then, we simply fill it with our favorite sandwich toppings or a salad and it's always a hit! Let me tell you, salad goes down pretty quickly when it's in the drivers seat. :) Have fun! I love, love, love my food to look good. There's nothing better than delicious food arranged artfully. So, I'm always on the lookout for new garnish ideas. Here's a fun one from https://www.cookin101.com/. It's a mushroom! Watch the video on how to make it here. Cool, huh? Think how great that would look with a green onion flower next to a nice steak. Yum! They have a lot of other free videos and fun ideas. My Friend, Suzette makes the best salsa EVER! I can't even describe it, it's soo good. Anyway, I finally weaseled the recipe out of her. We all covet it during the winter months when our gardens are little brown sticks and fresh salsa is just a dream. :) This is super easy to can in quart or pint jars so you'll enjoy it all year long. · Place all ingredients into a large pot and simmer for 1-1 ½ hours stirring occasionally (until desired thickness). · Pour into clean, hot jars.Wipe tops of rings and process in steam canner for 15 minutes. My friend Lisa (she's a great cook and super fun friend) found this easy version of Ratatouille, similar to the one they made in the movie. So, make some up, let the kids have fun layering, and maybe they'll eat their veggies! Original recipe by Smitten Kitchen can be found here. My kids had a blast making it we all enjoyed it. I sprinkled on some herbed goat cheese after baking and we ate it with Sausage and Green Chili Quiche for a French Night!